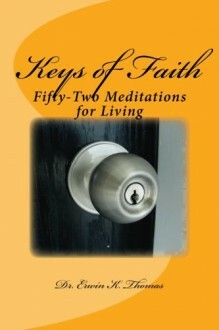 Keys of Faith: Fifty-Two Meditations for Living encourages Christian believers to take time and meditate on each devotion every week of the year. This devotional contains nine main doors—Attributes of God, Services for God, The Church of Truth, Blessed Lives, Ubiquitous Media, Diversity of Cultures, Special Needs, God's Healing Presence, and Blessings from God. It comes with spiritual keys to open them which are meditations assembled under every section. These reflections range from divine mercy, rights of Mother Earth, compassionate living, God's infinite wisdom, watchdogs of social development, improving American culture, disabilities enrich our lives, all lives matter, and successful marriages. In this devotional is a wide selection of topics which is uniquely organized to peak its readers' interests. It is one of a kind, are construed as prayers, meant for believers' keys of faith to open, and explore. These meditations not only do homage to biblical verses which support their concepts, but glorify the grandeur of God, by the national and international personalities, who in their own words have reflected on the grandiose and omniscient nature of their creator. These individuals who are from different nations, regions, and cultures of the world, include religious and civil rights leaders, philosophers, humanitarians, presidents, first ladies, entrepreneurs, businessmen, sports figures, scientists, anthropologists, psychologists, artists, and many more. Keys of Faith follows A Weekly Encounter: Fifty-Two Meditations of Hope (2015) which explored the depths of hope when giving praise and thanks to our gracious Lord and Savior Jesus Christ—who has so abundantly blessed us, in many indescribable ways.